Project obstacles and solutions: Hendrickson USA is a manufacturer of heavy duty vehicle suspension systems. They announced in January 2014 that they would build a new $20 million manufacturing facility in Elizabethtown, Kentucky. 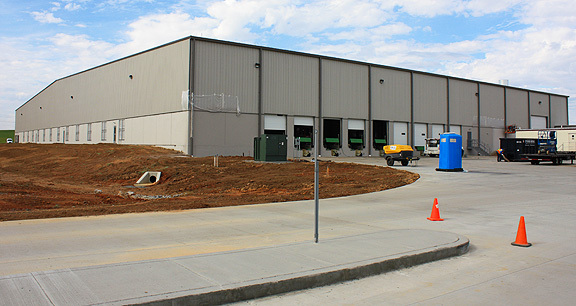 Forcum Lannom Construction was selected as the general contractor for the 100,000 square foot facility. Chris Johnson Construction did all of the flatwork and tilt up concrete work on the project. Forcum Lannom built all of the sidewalks and curbs. IMI supplied concrete for the entire structure, which included 3,000 yards for the foundation floor, 2000 yards for the parking lot/loading docks and 200 yards for the walls. With any commercial building project, staying on schedule was key. IMI worked with Chris Johnson's crews to supply concrete on time and at the pace of the finishing crews. The interior foundation floors were poured at four separate times with 750 yards each pour. The parking lot was poured in three segments, with IMI supplying up to 850 yards per pour. The walls for this facility were built with 10' tilt up concrete wall panels topped by prefabricated metal siding. The tilt up walls used a performance mix that has been tested by IMI specifically for these types of walls. Unlike formed walls, the concrete used in a tilt up wall is mixed with cement as the only binder. If other cementitious materials, such as fly ash or slag are used in the mix, they can cause the cured walls to stick to forms. Johnson used a bond breaker release and IMI QC/QA made sure the concrete chemistry worked with the release. The new facility is on schedule to open in November 2014.